Are you supplementing your courses with your own material? Did it take all summer to create, using books that reflect an approach you don’t agree with? Perhaps you worked for a year (or longer) to develop learning objectives that align with your course goals. If so, you are not alone. Many instructors are constantly seeking out materials that closely reflect the continuing changes they see in their students’ learning patterns year after year. One big advantage of using digital content is flexibility. Wouldn’t it be great if you could take good content and customize it to fit your teaching approach, making it a more cohesive learning experience for your students? We believe we have the solution—course material organized by learning objectives within a digital platform and optional custom-print text. View catalog for details. Statistics by Learning Objective enables you to teach what you want to teach, how you want to teach, when you want to teach it. Because each learning objective is self-contained, with narrative, assessments and videos that are mutually exclusive from the other learning objective elements within the course (considering the natural prerequisite topics), you have the flexibility to organize and group learning objectives in the order you want to cover them. 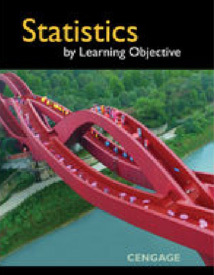 Statistics by Learning Objective is a learning objective-based, text agnostic course available in WebAssign! The 200+ learning objectives are more than any Intro Stats book. This product can fit any teaching pedagogy. Teach whatever topic you want, in the order you prefer—all in the powerful WebAssign environment. Don’t want to customize? Four different pre-built Course Packs offer you a head start in creating your course. Need a print text? Design your own book! Pick and choose the learning objectives you teach and have a book tailored just for your course. Through extensive research, Statistics students shared their pain points from past courses. The majority of students were struggling to find context in and outside the classroom—looking for extensive examples that speak to their interests and connect the dots to the Statistical concepts at hand. With a learning objective-based approach, material is presented to students in a way they can appreciate—outlining exactly what it is they should be learning for each topic in a scannable, research-tested, blog-like fashion. With examples specific to students’ majors, Statistics by Learning Objective creates a learning environment that applies to topics students already love. There is an average of 10 exercises per learning objective, that’s 2,000 total! Each learning objective has a variety of assessment types from true/false to numerical inputs and open response. In addition, questions range from simple recall of definitions to more challenging problems that require students to integrate skills and concepts from other learning objectives. The challenge questions reinforce the synthesis of knowledge beyond the modular structure. Problems span three levels of difficulty: Easy, Medium and Hard. Data Set Problems employ real-world data sets. Challenge problems pull information from prerequisite learning objectives already covered. Real-world examples help cover a variety of interests and show how content can connect with specific fields of study and/or life in general.